Is there anything more fun than oozing marshmallow and chocolate? Hmmm let me think about it, No way. These cookies are so much fun and the whole family can get involved making them. I found the greatest new treat at Target a few weeks ago from Kraft called chocolate covered mini marshmallows (click link for a pic of the package) and let me tell you, try to find them. I mixed them into this cookie dough and what you get is pure magical! No worries if you can’t find them, the dough is fabulous with or without them. Hope you all enjoy these finger licking good cookies as much as we did last night! Take a look! 1. Preheat oven to 350 degrees F. Beat butter and sugars in stand or electric mixer until well combined. Beat in eggs and vanilla until well combined as well. In a large bowl, whisk the flour, soda and salt. Add to wet ingredients as well as marshmallows, chips and M&M’s until just combined. Spread onto a large rimmed baking sheet that’s been lined with parchment paper and sprayed with cooking spray. Bake for 20-22 minutes or until edges are just turning golden brown. Remove and let cool completely. 2. Use your favorite cookie cutters to cut out shapes. Top bottom shapes with a layer of mini marshmallows and place under broiler until puffed. Top with hershey bars to melt. Top with another cookie to close sandwich. Serve warm. Caught my husband having a little late night snack right after my photo shoot. I think he liked them! I get to have my family for the week! It is such a treat to have my family here visiting us this week from AZ. We went to watch the sunset last night at the beach, here are some pics I snapped of our evening. Here’s to a great week! Come back soon for more tasty eats! Oh Jenny..looks yummy! That first picture is calling my name so strong!! I have seen the chocolate covered marshmallows…guess I better pick some up now! Great pictures. I'm glad you can enjoy having your family around this week! These are such a cute and fun treat! I will have to look for those little chocolate-covered mini marshmallows. Love your pictures at the beach. It's always nice to have family visit! Oh WOW!!! I have seen these with brownies, but what a great idea doing it with a chocolate chip! This looks so great! I haven't seen those new marshmallows…I'll have to keep my eyes peeled for them on my next trip to Target. These cookies look amazingly good, Jenny-can't blame your husband for having that late night snack at all! Everything about these is incredible. You have no idea how badly I want them! I have been on a s'mores kick all summer and this has only added to my passion. These are seriously good looking smores! I HAVE done a few things with those chocolate covered mallows and have some right now. They are so good just popping them in your mouth. 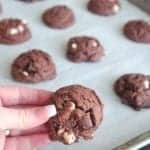 Holy cow–GREAT looking cookies and then to make them in to s'mores! Rockin! I love anything smores-inspired. Those cookies look amazing! I've tried the chocolate covered mini marshmallows too and they are awesome! Those certainly take smores up a level! Yum! And your sunset photos are beautiful too. Oh, smores with cookies sound SO good! I hope you have a lovely time with your family this week! Waaaaaaaa…wish we were there too!! I'm laughing seeing Mason and Roxy! The pictures you took are great! And those look scrumptious! Man…I thought I wanted dinner until I found this post. Now I want dessert instead lol. Great recipe…makes me drool just looking at it. Those looks yummy and messy! Those look completely irresistable! You've done it again, Jenny! Fantastic! Oh my I never thought I would say this but I wish I was your husband, lol! Just to eat thos sandwiches! Wow!!! That's just have everything I love! And those cool covered marshmallows, yummm! wow too good, have fun with your family my folks come tomorrow from Scotland! I know this has nothing to do with the yummy smore cookies, but I just got around to using my Mezzetta pasta sauce, and OH MY! It is DELISH! Thanks! "Oozing Chocolate Chip Cookie S'mor Sandwiches" Oozing in choco.. so delicious..
Those pictures made me drool. Gosh that looks so good. My mouth is still watering. Good Lord girl! That looks fabulous. I'm going to be on the hunt for those mini marshmallows. This is sure to be a summer hit! Oh my goodness, about time for a s'more comeback! You have such FABULOUS recipes this week. YUM! I'll be linking. Those looks so great! Thanks for sharing!!! Ooooh WOW. I made s'mores cookies a couple months ago and they were delicious. But yours look even prettier and more decadent!! Oh my gosh these looks sooooooo good. I s'mors but turning them into a cookie sandwich is ever better!!! These look so great! I just had s'mores over a campfire the other night. Should have seen this recipe sooner! I am so in the mood for an oozing dessert right now. These look fun and good! What fabulous treats! I have seen those marshmallows at Target! What a great product! Oh my I am totally drooling..I love chocolates! who doesn't? Wowzers! My kids would go crazy. I love the picture with your husband chowing down on them! haha. I just gained 5 pounds reading this and I don't regret it. YUM YUM YUM. Wow. I'm speechless. Thank you for enlightening me to another way to make s'mores even more amazing. I love the first photo where the Hershey's logo is melting…so pretty! These look decadent and delicious! Anything with "oozing" in the title has got to be good!! These look sinfully delicious! I have been wanting to make good old fashion smores, but boy am I glad I waited!!! Enjoy your time with your family in sunny California! We moved to California in January and have yet to get to the beach! After seeing your pics we might just have to take a trip next weekend. In the meantime we'll be eating smores!!! Those look absolutely delicious–what a terrific idea! oh i got some of those yummy chocolate marshmallows so I could try this. but haven't had a chance yet. By my point of view I recognize with you , no joke we will require a lot more posts from you about this subject !! Thanks ! Thank you for every other informative web site. Where else could I get that type of info written in such a perfect means? I’ve a undertaking that I’m simply now working on, and I have been at the look out for such information. Thank you for some other informative website. Where else may I get that kind of info written in such a perfect approach? I’ve a challenge that I am just now operating on, and I’ve been at the glance out for such info. Wow! I have tried several of your recipes and my son loves em – as do I! But I have to know, how on earth do you stay so slim with these temptations to eat every day?! Love your recipes, thank you!! !